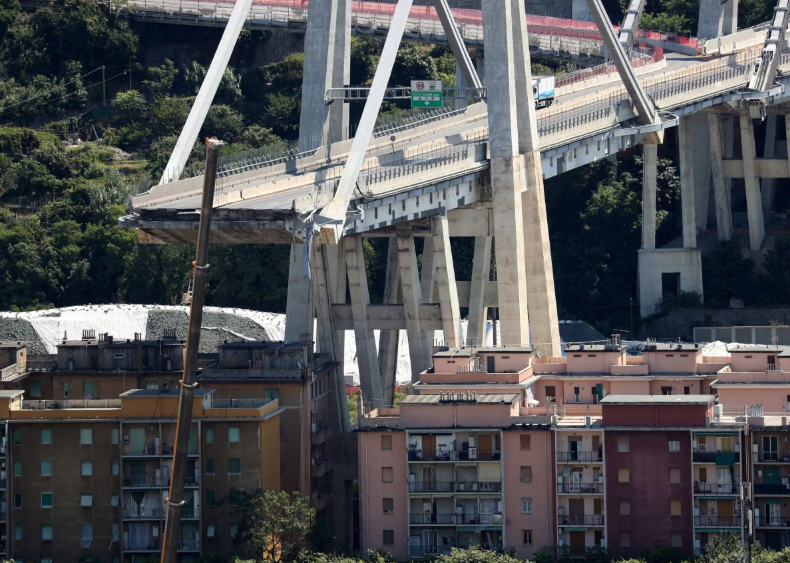 GENOA, Italy (Reuters) – Italian freight forwarders who say their business has been affected by a deadly bridge collapse in Genoa are taking legal advice and considering whether to sue toll-road operator Atlantia (ATL.MI) if the group is found responsible. The government has blamed an Atlantia unit, which operated the viaduct that collapsed killing 43 people on Aug. 14, for the disaster. The company is under judicial investigation, along with the transport ministry, for culpable homicide. The unit, Autostrade per l’Italia, has denied wrongdoing, saying regular, state-supervised inspections had indicated the ageing bridge was safe. A spokesman for Atlantia declined to comment. The freight forwarders are also looking into lawsuits against the government if the transport ministry is held responsible. The government denies responsibility. Spediporto, which represents about 330 freight forwarders in Genoa, says trucks are forced to take lengthy detours to and from the port since the collapse of the viaduct, which formed part of a motorway linking the city and its port with southern France. It fears shippers may choose alternative routes because this means an average shipping delay of more than an hour. “We have already contacted our legal advisers over the possibility of a collective lawsuit and we will take a final decision in the coming months when we have collected more data over the financial impact of the disaster,” Spediporto director general Giampaolo Botta told Reuters. The Genoa Chamber of Commerce estimates more than 14,500 businesses were impacted when a 200-meter (660-ft) section of the viaduct collapsed, including the container port which generates around 1.5 percent of Italy’s gross domestic product. It has started asking firms across the city to estimate the impact of higher transport costs arising from road detours and port delays. So far, it has spoken to 1,400 firms, said spokeswoman Anna Galleano. The survey is aimed at helping firms claim relief from state disaster-aid funds but the data could be used in future law s. She said the chamber had not sought legal advice “for now”. Civil lawsuits could take months to emerge but would pose an extra financial threat for Atlantia. Rome has already moved to revoke its national toll-road concession, worth 3.9 billion euros ($4.5 billion) a year, and threatened it with heavy fines. Autostrade has set aside 500 million euros to offer initial support to families and small businesses and also to rebuild the bridge, but the chamber said early evidence suggested the total damage could be much higher. “You can easily expect that the 500 million euros will be multiplied by four, reaching 2 billion euros,” Chamber General Secretary Maurizio Caviglia told Reuters. Any civil suit would have to wait until prosecutors wrapped up their investigation and could also be aimed at the transport ministry, if it was found to be culpable in its role as supervisor of safety on toll roads, said lawyer Lucio Galino. Under the Italian law, if prosecutors took Atlantia or the transport ministry to trial, businesses could file for damages with the same court. The trial judge could at the time of sentencing award provisional damages to those businesses. The government could also take legal steps. At a recent meeting in Genoa, state lawyers asked government representatives and local officials to keep records of extra emergency work and be ready in case it tries to claim damages against Atlantia, two sources familiar with the matter said. As a specialty service of Aries Global Logistics our products are backed by over 27 years of experience, a comprehensive global network, state-of-the-art technology, and the ability to service all worldwide markets. With over 35 years of experience in freight forwarding, licensed customs brokerage, logistics, and international shipping, we guarantee the lowest rates for shipping between the U.S. and Italy. Copyright © 2018 Freight Italia. All rights reserved.